Claimants in an Illinois case who allege injuries from cigarette smoking have asked the Judicial Panel on Multidistrict Litigation to consolidate all tobacco-related federal court cases in a single U.S. District Court for coordinated pretrial proceedings. In re: Tobacco Litigation, No. 1,231 (J.P.M.L., March 12, 1998, motion). Their motion does not ask the Panel to transfer the cases to any particular U.S. District Court. Instead, it asks the Panel to select a transferee judge with the "experience, expertise and energy" to handle the cases. Kenneth B. Moll and Hal J. Kleinman with Kenneth B. Moll & Associates, Ltd. of Chicago filed the motion on behalf of clients they represent in one class action pending in the Northern District of Illinois, Daley et al. v. American Brands et al. 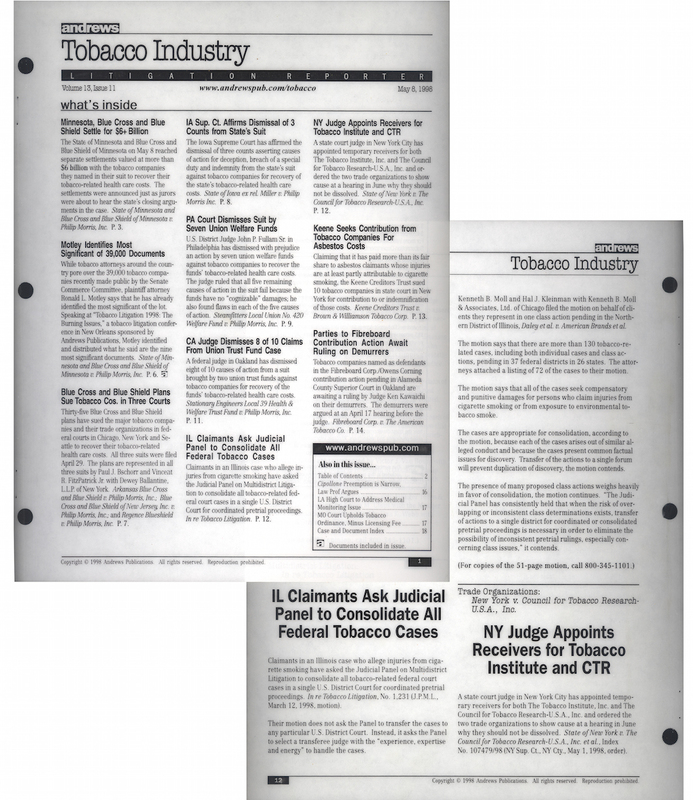 The motion says that there are more than 130 tobacco-related cases, including both individual cases and class actions, pending in 37 federal districts in 26 states. The attorneys attached a listing of 72 of the cases to their motion. The motion says that all of the cases seek compensatory and punitive damages for persons who claim injuries from cigarette smoking or from exposure to environmental tobacco smoke. The cases are appropriate for consolidation, according to the motion, because each of the cases arises out of similar alleged conduct and because the cases present common factual issues for discovery. Transfer of the actions to a single forum will prevent duplication of discovery, the motion contends. The presence of many proposed class actions weighs heavily in favor of consolidation, the motion continues. "The Judicial Panel has consistently held that when the risk of overlapping or inconsistent class determinations exists, transfer of actions to a single district for coordinated or consolidated pretrial proceeding is necessary in order to eliminate the possibility of inconsistent pretrial rulings, especially concerning class issues," it contends.